Ultimate Comics Wolverine takes a novel approach to its story. Half the book focuses on Logan and the other half focuses on his son, Jimmy. The impetus behind the comic seems to be about Jimmy discovering information about his father while uncovering the mystery behind a hidden message embedded in Logan’s final message to his child. Cullen Bunn delivers a solid first issue, pacing Logan’s story alongside Jimmy’s. The shift in the middle of the comic is well executed, and the two stories merge and transition nicely by the end. As a lead character, Jimmy’s likable enough and definitely not a carbon copy of his father (which is what I was worried about), but he’s nowhere near as captivating as Logan. Logan’s story is all kinds of cryptic, and Bunn only adds to the mystery by the end of the issue. Jimmy’s story, however, lacks the same kind of interest. While part of the story will focus on the hidden message, the other part will be Jimmy learning about his father. But the addition of a sidekick named Black Box makes the story a bit clichéd, especially because Black Box is a kind of fearless whiz kid. While I was intrigued by the mystery of the embedded message Black Box discovers, I’m not drawn enough to Jimmy to follow him on his path of discovery. I was also not drawn in by the art. David Messina does a serviceable job, but a lot of his characters look stiff and flat. Faces are uneven in successive panels, and the poses he puts his characters into look silly at times. The inking and shading is a bit heavy, creating a garish style, and action sequences are nowhere near as smooth as they could be. That being said, I won’t give up on Ultimate Comics Wolverine just yet. It didn’t draw me in like I had hoped, but it provided enough of a groundwork to pique readers’ interests. The real challenge will be in giving people a reason to return every month, and I’m just not sure Ultimate Comics Wolverine has it. While Doc Ock is ruining Peter Parker’s life over in the pages of The Superior Spider-Man, he hasn’t managed to create the same kind of chaos in Avenging Spider-Man. This book, once again, provides a different and more likable side to Otto Octavius. What I noticed immediately was Marco Checchetto’s art. His drawings are as sharp as David Marquez’s, but his style is more in line with Sara Pichelli – smooth, glossy-looking characters that are sleek and lithe in design. Occasionally, Thor’s face looks pinched and uneven, but the rest of the book has great imagery, especially in the Thor/Electro fight. Rachelle Rosenberg provides great colorization, particularly with Electro, and the antimatter Max Dillon is cleverly created and provides a great villain for the story. Chris Yost writes a tale that’s really about Otto’s ego versus Thor’s ego. I’m still not completely sure why Otto helped Thor out, but Yost gives a pretty cool explanation, saying that Otto wanted to have the life of a god in his hands. But furthermore, the cryptic final page gives a hint to Otto’s true plan, which is both intriguing and sinister. Yost also balances action and story well, delivering some great dialogue between his characters while still creating an exciting situation to keep readers engaged. Otto’s wearing thin in The Superior Spider-Man, but here he’s a much cooler character. 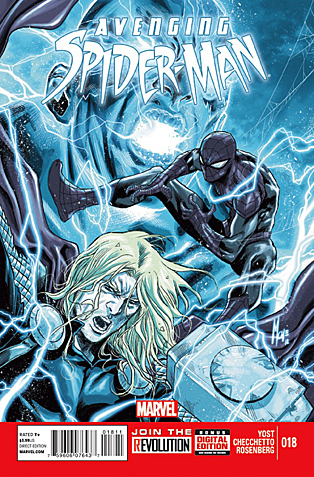 The team-up aspect is part of what makes Avenging Spider-Man work, but I also think it’s Marvel’s choice of talent on the book. Avenging Spider-Man once again delivers a solid issue. 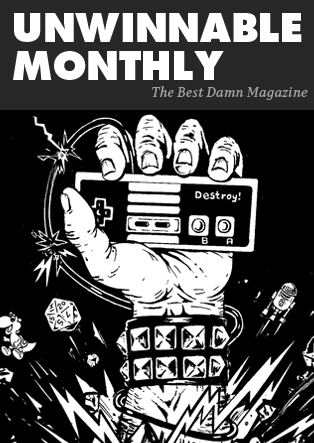 The comic is a very safe bet each month, and issue #18 only further illustrates this. With Yost’s quick-paced, yet engaging, storytelling and Marco Checchetto’s polished art, Avenging Spider-Man has everything it needs to be a successful book. Bannen’s Book of the Week: I have read very few comics with this much emotional punch. Peter Tomasi’s dialogue-free Batman and Robin #18 is a visceral and powerful story of a man’s attempt to grieve over the death of his son. 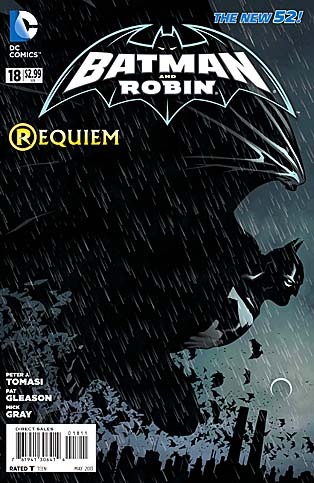 The book is a perfect mix of solid storytelling as well as page after page of impressive and moving art, both of which show the fallout of Damian’s death and the way Bruce deals with it. To start, Pat Gleason sets the tone with the opening image of Bruce sitting before a fire, his eyes burning with rage. 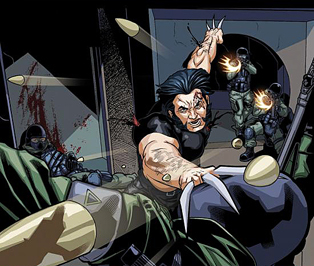 The rest of the comic is a mixture of this kind of imagery, as Gleason is the real star in his attempt to show Bruce’s raw emotions. The result is genuinely touching, and I was surprised to feel a lump in my throat by the end. Gleason’s art is top-notch with tonal shading in all the right places, smooth finishes on the character faces and a series of colors that aid in the mood of the story. His point-of-view shots hit every emotional beat and pace the story so that it transitions smoothly from beginning to end. Additionally, Mick Gray does some of his best work of the entire series, and John Kalisz’s colors give the visuals the necessary emotional pop at all the right moments. Because we’re dealing with Batman, and he spends his nights beating criminals, Tomasi shows how Bruce grieves as he tears through the streets of Gotham taking his anger and sadness out on hapless criminals, all of whom he leaves in a bloody mess by the time he’s finished. But Tomasi also doesn’t give the character any cathartic release. We watch Bruce reel from moment to moment, until Tomasi twists the knife a bit more at the end. When Bruce does get some sort of release, the reality is that he’s still at a loss without his son. The hollowness created in his character is palpable, and readers will definitely experience Bruce’s loss for themselves. Batman and Robin does the characters justice with its tale of loss and grief. The pain that Bruce feels is aptly portrayed by Peter Tomasi, and Pat Gleason and the art team create one beautiful image after another across all 22 stirring and moving pages. While I still don’t believe that Damian is dead, I cannot ignore just how sad it is to see how his death has impacted others.